The WET3300SQ is a combo unit that features various capabilities including eight automatic cycles for the washer and six cycles for the dryer. With two functions in one, the unit is ideal for small spaces with the convenience of a high quality wash at your service. Model is top loading with a height of 71 5/5 inches, width of 27 inches and depth of 32 inches. Read further for a more comprehensive overview of the unit. - It offers eight automatic cycles. - It comes with a white porcelain basket for durability. - It comes with four wash/rinse temperature combinations. - This model features Stepped Down Agitation. - It allows for three temperature selections. - It comes with a double duty Surgilator Agitator for high quality wash.
- It is equipped with bleach dispenser. - It features a self cleaning lint filter. - It comes with four water level selections. - It features a durable ToughTop II Lid. - The dryer comes with an end of cycle signal. - A capacity of 5.9 cu. ft is allowed for the dryer. - It features an automatic dry control. - It has a fabric softener dispenser. - It allows for six different cycles. - It comes with 3 wash/spin speed combinations. - It features a side swing door. - It has a tumble press cycle. - It comes with DuraWhite interior. - It features a 4-way venting option. 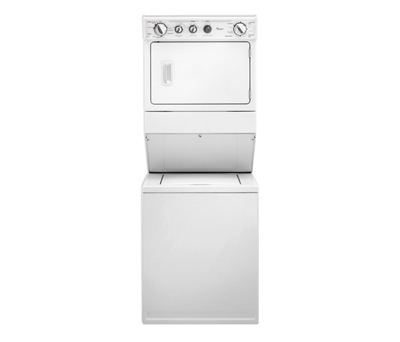 This unit features a combo of washer and dryer that makes it incredibly efficient to have inside the house. The washer allows for a capacity of 2.6 cu. ft while the dryer has a whopping 5.9 cu. ft. capacity. The design makes it easy to fit the unit in any home décor and occupies little space with its combo function. The washer feature a surgilator agitator for a more through clean per load and a bleach dispenser to strategically release detergent at just the right moments. Three temperature selections are made available as well as a self-cleaning lint filter for convenience. Durability is ensured with the porcelain basket and ToughTop II lid. A four way venting option is also made available to minimize lingering odors from the fabric. Although convenient, the WET3300SQ model lacks a few features including Energy Star Efficiency. Also, the unit has no interior light, water heater and reversible door. Noise is not tampered down and hence operation produces more sound that necessary. Features like the wrinkle guard, quick rinse setting, soak setting and sensor dry are noticeably absent. Unit is also more expensive when compared with other models.